It’s the end of the summer and the end of our roadshows for the moment, as we return from the sunshine and sea air of Hunstanton Sea Life Sanctuary. The Explore the Seafloor team were glad that the high winds and torrential rain that greeted them on arrival were quickly replaced by blue skies and warm sunshine. It was busy over the August Bank Holiday weekend with huge numbers of people guessing artefacts in the water-table, enthusiastically sieving the geology samples and digging for facts in the sandpit. We had lots of visitors enjoying the activities and many children spending their last week of school holiday freedom learning about the seafloor off the East Coast. 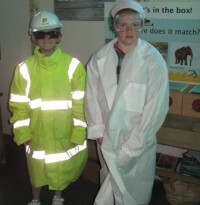 Many people enjoyed dressing up as a scientist or dredging industry staff and the waders proving particularly popular. We also chatted to several people about sea level changes off the Norfolk coast following a particularly well-timed episode of BBC’s Coast about submerged forests in the region. We’re taking a short break from roadshows while we prepare some online resources about the project. Our next and final roadshow will be at Birmingham Sea Life Centre during October half-term. 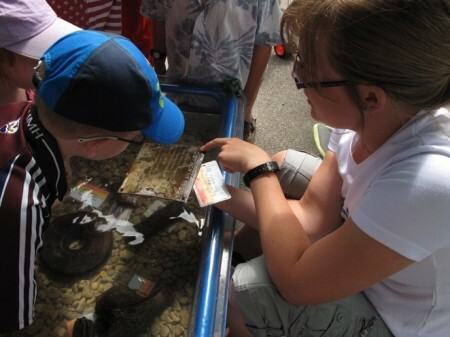 Join us to get your hands wet and Explore the Seafloor at Hunstanton SEA LIFE Sanctuary from the 28th of August until the 5th of September. Wessex Archaeology is bringing the roadshow back to Norfolk. We have lots of exciting activities for visitors to Explore the Seafloor of Britain’s coastal waters. Bring your family, or embrace your inner child, and dress up as a maritime archaeologist, scientist or marine dredger! We have real archaeological artefacts to hold including part of a World War 2 machine gun, a 10,000 year old mammoth tusk and part of a 1950s airplane. Younger children can dig for finds in the sand pit and touch artefacts in the water table. Take a break from the beautiful beaches of Hunstanton and pop into the Sea Life Sanctuary to visit us. Scientists have spent the past 2 years investigating the exciting world beneath the sea and now it’s your turn!